ENGLAND WIN 4-3 ON PENALTIES. COL – OSPINA, ARIAS, MINA, D SANCHEZ, MOJICA, LERMA, C SANCHEZ, BARRIOS, CUADRADO, QUINTERO, FALCAO. ENG – PICKFORD, WALKER, STONES, MAGUIRE, TRIPPIER, HENDERSON, YOUNG, DELE ALLI, LINGARD, STERLING, KANE. 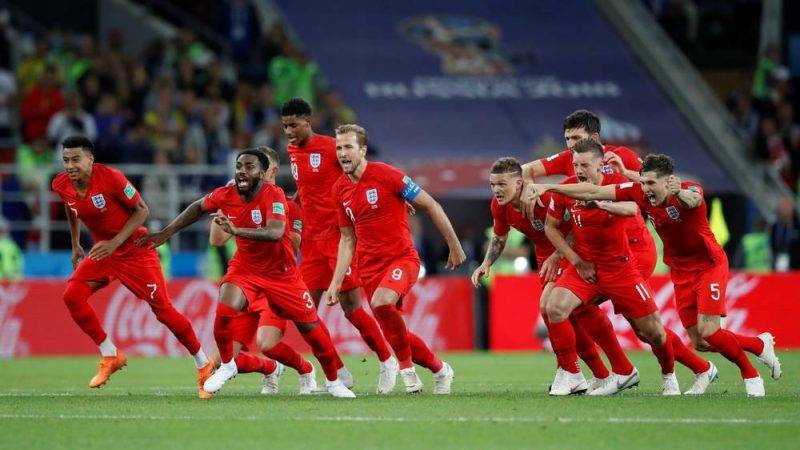 England exorcised their World Cup demons by beating Colombia on penalty kicks to set up a quarter-final against Sweden. Tournament top scorer Harry Kane scored the opening goal of the game, beating David Ospina from the penalty spot after he was hauled down by Carlos Sanchez. But in the 94th minute, Barcelona defender Yerry Mina headed home a dramatic equaliser to take the game into extra-time. The game then went to penalties with England prevailing 4-3 thanks to Eric Dier’s dramatic winning spot kick. Gareth Southgate’s side will now play Sweden for a place in the last four on Sunday but – in typical England fashion – they did it the hard way. Harry Kane grabbed his sixth goal of the World Cup by rattling home a 57th-minute penalty after ex-Aston Villa midfielder Carlos Sánchez grappled him to the floor. But in the third minute of stoppage time Barcelona defender Yerry Mina guided home a header from a corner to force extra-time and England looked shot. Los Cafeteros took control of the game for the first time but could not find a winner. Penalties, inevitably, were required to find a winner. England blinked first when Liverpool skipper Jordan Henderson saw his effort pushed around the post by Arsenal keeper David Ospina. But Mateus Uribe thumped the bar with Colombia’s next kick, allowing Kieran Trippier to level. Carlos Bacca was then denied by Pickford before Dier stroked home the winner to give England their first penalty triumph since beating Spain at the 1996 European Championships. England’s strength is in attacking midfielders. There aren’t any elite out-and-out defenders, so it makes sense to utilise the on-ball abilities of the ‘quite good’ ones that the nation has. Playing a back three helps brings this out, while also adding an extra body to help defend close to the box. Late in extra-time, England started to pick up – mostly because Colombia were tired and gaps started to open up. Without these gaps, bringing Jamie Vardy on earlier would have been unlikely to work. So, yes, perhaps the best option would have been to embrace English nature and lump it long for a bit. 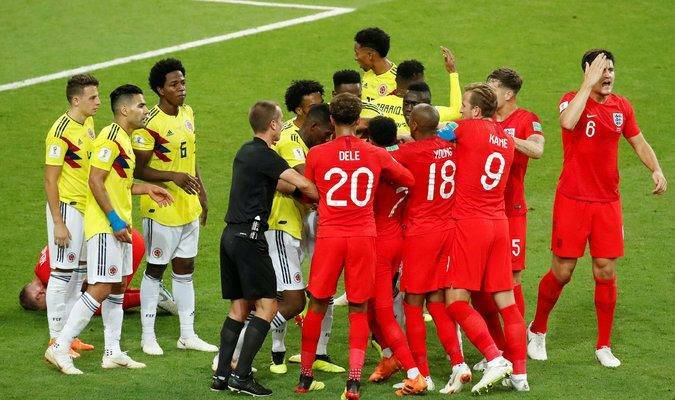 At best, it could have led to winning loose balls high up the pitch; at worst, it may have been a betrayal of the system, but it would have forced Colombia to think differently.